Life’s beauty lies in knowing that the tougher the situation, the stronger you will emerge from it. Of course, one good way to remind yourself that you can survive, endure and get through a crisis is to look up to someone who has done something similar. In our case, Vaani and I looked up to Amitabh Bachchan and his wife, Jaya. Their company went bankrupt too. They had loans of Rs.90 crore, 55 legal cases and several creditors at their door for months and years on end. At one time, their house, “Prateeksha”, in Juhu was attached by a bank for a loan default. But despite being the celebrities they were, they overcame the embarrassment of being without money and faced their situation stoically. It is from seeing how they did it that we believed that we too were capable of being resilient. Each of us is resilient. To be resilient is not rocket science. You must however believe that no matter what, there will always be a door that will open. So, when everything is dark, when there is absolutely no way out, breathe easy. Because when it is dark is when light can shine! Light cannot shine when it is bright. When what you see are only walls, and no road ahead, anchor within, with your deepest intent. If you have integrity of purpose, the walls will make way for doors to open, even mountains will move, to roll out a path in front of you! Consider this: take your own Life. Make a list of all the crises you have faced so far. And make a list of learnings you gained and personal traits you see developed in yourself through those situations. Give yourself a score on 100! I bet you, you will score a full 100! Problems and challenges are Life’s way of humbling us. Of coaching us. What is the point of all this you may wonder? Why do I want to be taught anything? I just want to be left alone, you may protest. But such is Life. You can say what you want, think what you want, but Life will still do what it wants. So, the best thing to do in a situation, where you are not in control of the game, but are merely being played on, is to sit back and count your blessings. In a crisis, the greatest, and perhaps only, benefit is the lesson it teaches you. 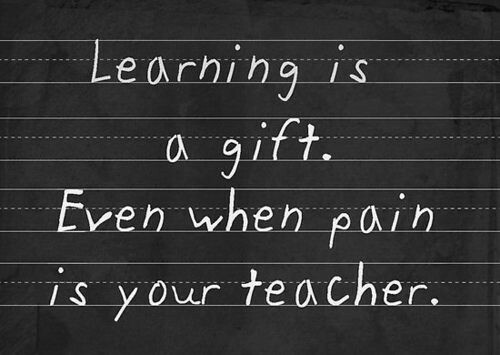 Celebrate that learning. Each new learning makes you wiser. In India, we have a custom, a tradition, of touching the feet of those older to us, and seeking their blessings. Many do it mechanically, mindlessly. They do it thinking it is a sign of respect. It surely is. But what you are actually doing is telling the older person, “Boy! You have a wealth of experience with living Life and I salute you!” The older person was not born any wiser than you were. But Life taught her or him. They learned. Are you willing to?